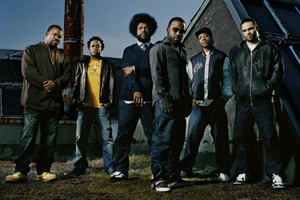 To longtime fans of The Roots, there was something exhilaratingly fresh about the band’s two-hour set at Davies Symphony Hall in San Francisco late last month. That familiar Roots’ sound, jazz-inflected and grounded in the essence of hip-hop, was certainly front-and-center, louder than a bomb in the same hall where Michael Tilson Thomas conducts the acclaimed San Francisco Symphony. All of the familiar elements were there: Black Thought‘s yeoman-like wordplay, Questlove‘s dynamite back beat, the virtuosic instrumental solos, and the ability to mix bits of oft-sampled classics like the Incredible Bongo Band’s “Apache” and Curtis Mayfield’s “Move On Up” into its own tracks. The band played material that spanned from 1994’s Do You Want More?!!!??! to 2008’s Rising Down, and even mixed in some new joints from its forthcoming ninth studio album, How I Got Over. But there were also some striking differences. For one, instead of the Hip-Hop 101 medley of classic covers that the band has mastered over the years, the set included bits of a collection of covers so diverse that few bands would even attempt to play them all. 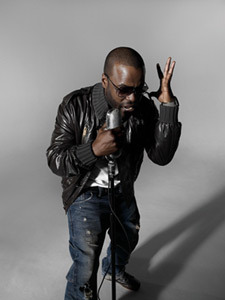 Within the course of a nearly 20-minute version of their 1999 breakout hit “You Got Me,” guitarist Captain Kirk Douglas led The Roots through a scorching mash-up medley. The sequence included Guns N’ Roses‘ “Sweet Child O’ Mine,” Donna Summer‘s “Love to Love You Baby,” Muddy Waters’ “Mannish Boy,” Led Zeppelin‘s “Immigrant Song,” and a Douglas talk box solo that riffed on the horn blasts of Outkast‘s “SpottieOttieDopalicious” and Stevie Wonder‘s “Don’t You Worry ‘Bout a Thing.” It was downright exhausting – and thrilling. More than anything, the entire demeanor of the eight-piece group, blue-collar and rock steady for its 18 years as one of the hardest working bands on the planet, seemed like it had been lifted by the thousands of balloons featured in the Pixar movie Up. As Douglas and bassist Owen Biddle dug into their respective solos, their bandmates didn’t sit to the side of the stage as usual. Instead, they bounded all over it in full-on party mode, high-fiving fans standing in the terrace behind and above the stage. 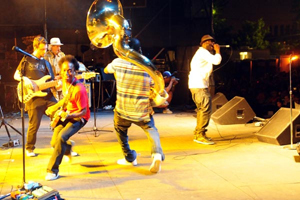 They hopped into the crowd, which the full band paraded through at the show’s outset, led by sousaphonist Damon “Tuba Gooding, Jr.” Bryson. Percussionist F. Knuckles even took a gleeful tumble on the stage at one point. There’s a reason for this buoyancy, and it wasn’t just the chance to be the first hip-hop act ever to play in San Francisco’s most revered concert hall. You see this show, like many of the band’s concerts in the past few months, was more of a field trip than a tour stop. The band has spent the better part of its 18-year existence on the road, touring all over the world and playing upwards of 200 shows a year. Heck, in their fledgling years in the early 1990s, The Roots were arguably bigger in parts of Europe than they were in their hometown of Philly. 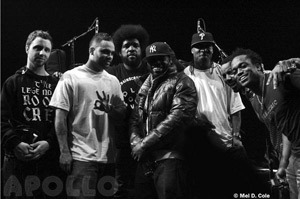 But in 2009, The Roots are road warriors no more. And Jimmy Fallon, of all people, is largely responsible. The former Saturday Night Live star with a dubious post-SNL film career took over Late Night with Conan O’Brien in March and asked The Roots to be his house band. And somehow, in the interests of stability, maturity and the possibility of making the same amount of money while sleeping in their own beds, The Roots said yes. “We welcomed the challenge,” Questlove says as he gets ready to go on stage at Davies, his prolific multi-tasking skills on full display. As we sit down, the Twittering fiend is fixing his tie, listening to some Slum Village on iTunes, checking the score of the Cleveland Cavaliers-Orlando Magic game and discussing Fallon. The nexus between Fallon and The Roots, he says, was Neal Brennan, co-creator of Chappelle’s Show and a consultant on the run-up to Fallon’s Late Night launch. 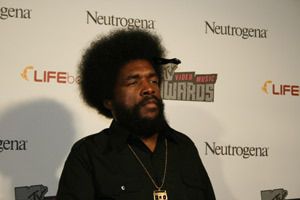 Questlove served as the de facto musical director for seasons two and three of Chappelle’s Show. Well, sort of. In addition to the weekend shows, the jam sessions, and recording How I Got Over, the band just hosted its 2nd annual Roots Picnic, an event that is turning into yet another major contender on the festival circuit (see the JamBase review here). The Picnic featured sets from TV on the Radio, Black Keys, Santigold, Asher Roth, King Cudi, and The Roots themselves. In the highlight of the weekend, The Roots and the Antibalas horns backed Public Enemy for a performance of its seminal, 20-year-old album It Takes a Nation of Millions to Hold Us Back in its entirety and in reverse. And then there’s the Fallon show, which amounts to a full-time gig that is considerably more complicated than you’d expect. Fallon and the show’s producers have utilized The Roots more with each passing week. Questlove says he’s involved with production meetings, skit meetings, meetings with writers, and obviously, band rehearsals. Music is a centerpiece of the show, and it requires heavy lifting that isn’t obvious to the average viewer. 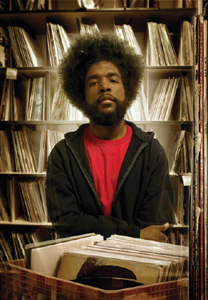 While the at-home audience only hears The Roots play 8-to-10-second instrumental “sandwiches,” as Questlove calls them, as bookends for commercial breaks, The Roots play straight through those breaks for the studio audience, hyping up the crowd. Not surprisingly, the band also pulls out all the stops for the terribly brief “walk-on” songs, which accompany a guest’s walk from behind the curtain to the chair next to Fallon. For Denise Richards, the band played “Wild Thing,” and for Vanessa Williams, they nodded to her starring role in Ugly Betty by riffing on Ram Jam’s monstrous “Black Betty.” When Stephen Baldwin visited the show, the band played the Bee Gees’ “Jive Talkin,'” poking fun at the actor’s recent comments about President Barack Obama on Fox News. It’s an album that deals with angels and demons. And man’s inner struggle to do good and the temptation to do bad, which is easier than taking the scenic route to good. It would have been very easy to do the celebratory ‘It’s a new day’ kind of thing. This is the light at the end of the tunnel record but there’s this sort of gasping for air. The other regular Roots skit is loosely titled “Audience Improvisation.” Fallon picks an audience member to give their name, their hometown and some random fact about them. Fallon then gives The Roots the details and a musical style, and the band dives into a brief jam that incorporates the given facts. They nail it every time. 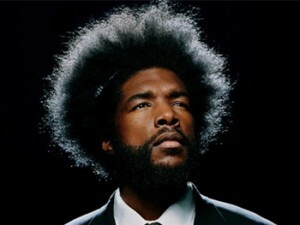 “We have a little system that helps us,” Questlove says. “We know that we’re doing three songs, but we don’t know the details or the style. Usually the first song Kirk handles, and the second song Owen handles and the third song [keyboardist] James Poyser handles.” The band rarely needs a moment to rehearse the tune, although The Beach Boys sound recently had them searching for the right harmonies for about 30 seconds, Questlove says. While the segments, the sandwiches and the walk-ons all show off the band’s incredible versatility, Fallon’s musical guests have a helluva choice: perform your song as you would at any other venue or supercharge it with backing from The Roots. To date, a number of stars have chosen the latter, to stunning effect. Ludacris, Rick Ross, the Beastie Boys, Chrisette Michelle, Asher Roth, and Mos Def> have all gotten The Roots treatment. Questlove says his favorite was when The Roots and the Antibalas horns backed Public Enemy for an incendiary rendition of “Bring the Noise.” Two weeks ago, Paul Simon was joined by The Roots and the Antibalas horns for a breezy rendition of “Late in the Evening” that had the 67-year-old legend getting down as percussionist F. Knuckles unloaded on the timbales. 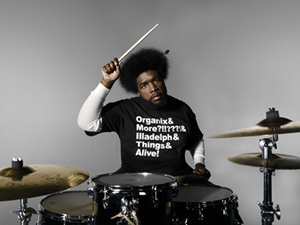 “I’ve really enjoyed all of them,” Questlove says. The band is about “80-to-90 percent” finished with How I Got Over, although Questlove recently posted a Tweet that said an expected August release has been pushed back to October “in a well thought-out effort to give you people the best product possible – and to give [their record label] Def Jam proper set up time.” On the heels of 2006’s Game Theory and 2008’s Rising Down, the darkest albums of the band’s career, Questlove says that the dawn of the Obama era has given them a glimmer of hope but not yet unadulterated celebration. The title is a reference to the Clara Ward gospel hymn made famous by Mahalia Jackson. The album will feature collaborations with Chrisette Michelle, Beanie Sigel, Young Chris, Blu, Phonte from Little Brother, and Pharoahe Monch. 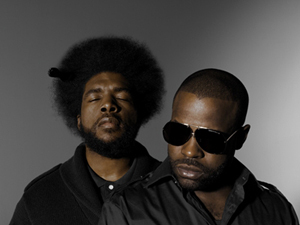 The band has also worked with Cody ChesnuTT, the rarely seen singer-songwriter who re-recorded his song “The Seed” with The Roots in 2002. They’ll do the same on How I Got Over with ChesnuTT’s “Serve This Royalty.” The album also features a cover of Gary Bartz’s “Celestial Blues,” featuring its original singer, Andy Bey. The Roots have always been a proud band, able to let artistic impulse guide them through a bevy of shifting popular tastes over the years. They’ve weathered lineup changes and record label drama like pros. While How I Got Over hints at survival of the Bush years, it’s also an assessment of the hip-hop landscape. When The Roots recorded their debut Organix in 1993 to promote at European concerts, the most popular hip-hop acts were Arrested Development, Naughty By Nature, and Onyx, while a 20-year-old upstart named Snoop Dogg was propelling Dr. Dre’s “Nuthin’ But a G Thang” up the charts. Now they look around, and many of their peers have fallen off, or gone through lengthy periods of creative infertility. In their early years, The Roots were frequently reminded, even in their hometown, that the world wasn’t ready for a live hip-hop band. But their own dedication to live performance has spread virally throughout hip-hip, with live bands becoming much more prevalent for big-name acts in recent years, particularly with the likes of Jay-Z and Kanye West. At Davies, The Roots showed themselves to be much more than that. They are a globe-traveling jukebox, a sonic beauty that has reached that perfect age where it has curves in all the right places and enough experience to know how to wield them. As elated fans filed out of Davies, the band seemed in no rush to head back to the hotel – heck, Questlove was off to play a three-hour “W Night” DJ gig, where he played nothing but Wu-Tang Clan and Stevie Wonder. He and Knuckles signed drumsticks and tossed them into the crowd, and the whole band shook hands with fans and soaked in the love. Nearly two decades on, The Roots continue to blossom, and they’re loving it.